Whether in an office setting or industrial environment, noise is a common problem in any workplace. Talking coworkers, ringing phones, elevator sounds and computer noise can cause disturbances, interrupt communications, and interfere with the daily work flow. In an industrial environments, loud machine noise can cause hearing damage and interfere with communication on the production floor. Excessive workplace noise should be reduced to prevent both the disruptive and harmful effects that noise can cause. Applying simple acoustical treatments to the room, office floor, or industrial environment can help. While different solutions are appropriate in different circumstances, there are many ways to reduce noise and improve acoustics. To begin, simply adding Acoustic Panels to the walls of an open office plan or call center will absorb unwanted noise to help achieve comfortable sound levels. Incorporating Art Acoustic Panels in an office environment can offer both noise control and an aesthetically pleasing look to any setting. For example, a combination of Art Acoustic Panels and Acoustic Coffee Bag Panels adds an authentic and creative vibe to this workplace break room. Acoustic Ceiling Panels fit standard drop ceiling grid systems and are an easy way to upgrade the acoustical quality of the room without usage of wall space. For industrial environments, the simple application of 2” or 4” Acoustic Foam Panels inside an HVAC room or plant enclosure can greatly reduce harmful sound levels and help improve speech intelligibility on the production floor. 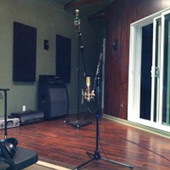 Acoustic treatments of black microsuede 24 x 48 x 4 acoustic panels at Deep Roots Studio.